Meanwhile, warm 1 tsp oil in a large frying pan and brown the bacon until just crisp. Drain the pasta, reserving about 100ml cooking liquid. 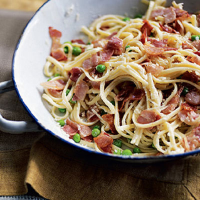 Tip the drained pasta into the frying pan with the bacon and the peas. Toss well over a high heat, adding the reserved cooking water, lemon zest and juice. Within a few seconds the water will start to cling to the pasta, giving it a satiny finish. Remove from the heat, add the remaining olive oil and the parmigiano reggiano, then fold in spoonfuls of the ricotta just before serving. This recipe was first published in Thu Jul 01 01:00:00 BST 2010.